Chesterfield FC caretaker boss Mark Smith believes his side have foundations to build on, after their late FA Cup fightback against Walsall. Sam Morsy hit a dramatic 89th minute leveller to secure a battling 1-1 draw against Walsall, and a place in the FA Cup third round draw. The Saddlers hit the front through a Richard Wood own goal as they took advantage of the strong wind. 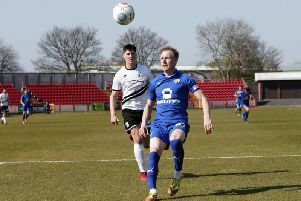 But Chesterfield showed a fight so badly lacking during Dean Saunders’ short reign at the club to level during a rip-roaring final five minutes. A proud Smith said: “We had lost our last four games and we couldn’t go with the same formation. I wanted my most experienced players out there. “We did not create too many chances in the first half and looked a bit tentative. But I didn’t think there was much between the two teams, I don’t think there is much between this league. “It was a different story in the second half and we made great use of the wind. “We got the ball in the danger areas and looked really threatening. Our fightback is a great testament to the players for maintaining their belief. “We are still in the hat which is most important. We will go to Walsall knowing who we will face in the next round and it is up to us to make it happen. “I am really pleased for the lads, I wanted them to get something from the game because they deserved it.